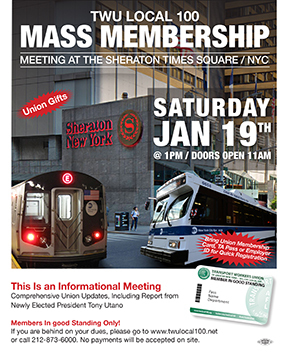 Join your Brother and Sisters at our annual Mass Membership Meeting at the Sheraton for a review of our accomplishments in 2018 and our plans to get a good contract in 2019. Good standing only! Download our flyer to register here. There will also be a health fair at the meeting for information about nutrition, exercise, and treatments to insure wellness.